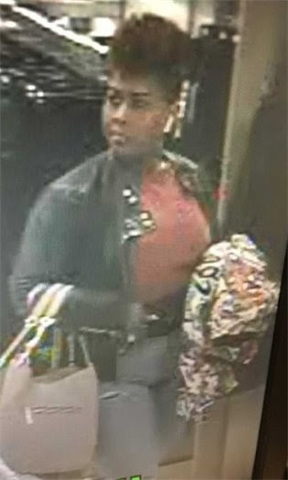 State College police are looking for a woman who allegedly attempted to steal hundreds of dollars worth of merchandise on Saturday from Macy's at the Nittany Mall. Police said that the suspect engaged in a physical confrontation with the store's asset protection staff when they approached her. The suspect (pictured below) is described as a black female with dark hair that was pulled up. She was wearing jeans, a peach or pink shirt and denim jacket. Anyone who may be able to identify the suspect or who has information about the incident is asked to contact the State College Police Department at at (814) 234-7150, by email or by submitting an anonymous tip through the department's website.